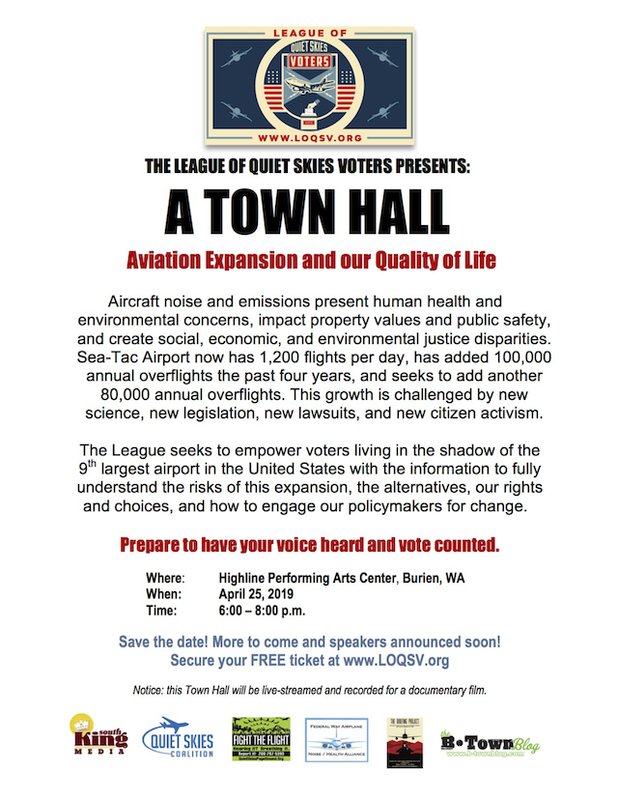 The League of Quiet Skies Voters is holding a town hall in Burien about their concerns about airplane noise in communities near Sea-Tac. But residents in Shoreline - Lake Forest Park also have serious concerns about airplane noise. North End Neighbors Airplane Noise Group (NENANG) is comprised of 50 or so residents in the north end of the Puget Sound Region who are being negatively impacted by ever-increasing air traffic, noise and pollution. North Seattle and the cities of Shoreline, Kenmore, Edmonds, Lake Forest Park and Bothell are all represented. Since about 2015, air traffic over the entire region has dramatically increased. But what really changed life in the north end for the worse was the FAA's decision to route all south-flow SeaTac arrivals down one narrow flight path, a "sacrificial corridor," instead of utilizing many arrival routes over a wide area as had been traditionally done. This assembly line of planes has resulted in a narrow band of the community being bombarded with all of the air traffic, all of the noise and all of the pollution of arriving planes 65 to 70 percent of the year. Much of this corridor runs through a natural inversion zone which bounces aircraft noise back down to the ground, resulting in a "double whammy" for residents. With the recent implementation of the FAA's Wake ReCat program, which shortens distances allowed between aircraft, the frequency of air traffic over the north end has become tortuous for residents under the corridor. It is now common to hear two commercial jets fly overhead within the same minute! South-bound traffic arriving into SeaTac Airport does so for hours at a time with barely any silence between planes, day after day after day, from early in the morning until well after midnight. Add to that the recent start-up of commercial traffic out of Paine Field, flights that are frequently at 2000 to 3000 feet to accommodate SeaTac traffic, and Kenmore Air seaplane traffic which is often as low as 800 feet. The creation of NENANG followed a series of community meetings called by Shoreline resident Jean Hilde after her many attempts to seek help from elected officials failed. In September 2018, Jean acquired the Airnoise.io system which reports airplane noise at the push of a button. Since then, she has filed over 5,600 noise complaints with SeaTac and Paine Field. Join NENANG by sending an email to Jean Hilde, or by visiting North End Neighbors Airplane Noise Group at Google Groups.